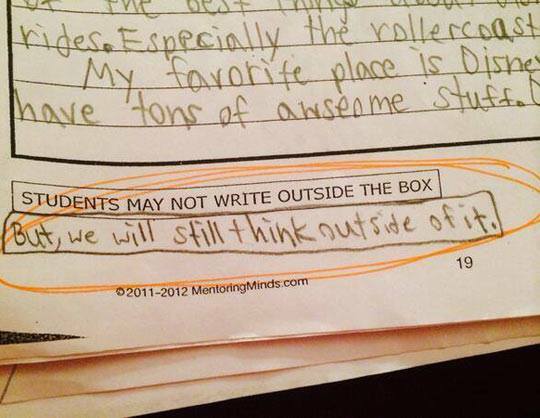 A member of my Twitter PLN ( @jgates513 ) tweeted this today, and there’s just no enhancing it. 9-yr-old brilliance. I hope and pray that we are not killing this kind of thinking in our kids! Wouldn’t it be great if we could get the politicians out of the decision-making process and let the educators do what they know how to do to help kids? Just What Are Our Brains Capable of? Look at the amazing infographic below! Makes me wonder not necessarily what my brain is capable of, but rather what the brains of our students, sitting before us learning to take multiple choice tests, are really capable of. Aren’t we running the risk of dumbing them down, anesthetizing them, to the point that we lose–or distort– all that brilliance? As a new school year begins to rev up, I hope to remember–each and every day–how amazing each of our kids is. Lofty goal, but worthy.